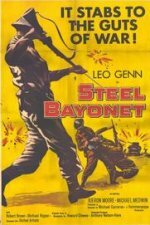 A British war movie, made by Michael Carreras, whose father Sir James owned Hammer Film Studios. Carreras directs rather in the style of an American platoon picture, the title is reminiscent of a Sam Fuller movie, as it deals with Leo Genn and his battle-worn men who are ordered to hold a farmhouse during the Allied assault on Tunis. As in American movies, the men embody a variety of attitudes towards the morality of war, heroic, cynical and all points in between, but, this being a British movie, it all comes down to class attitudes and whether your accent is posh or working-class.